For the last couple of days I've been working to get a simple REST service up and running at Google AppEngine using the Google Cloud Endpoints framework presented at Google IO 2012. The introduction at the page just linked to in addition to the documentation gave the impression that this was a very simple and straight forward framework to use. It might be, but I still used three days to get a hello world application up and running. The reason for this is compound. I may be an idiot, but I will also put part of the blame on an incomplete documentation by Google. The Google Cloud Endpoints techonology ("Endpoints" from now) is still only in semi-closed beta though, so I should probably not expect more. In any case, I am writing this blog post so that others will only use the single hour needed to get a hello world app up and running instead of the full three days* I used. The Endpoints technology is available for all to use - you do not need to join the trusted testers group other than for getting access to the documentation. You should still of course do this. I will also refer to this documentation in this post. 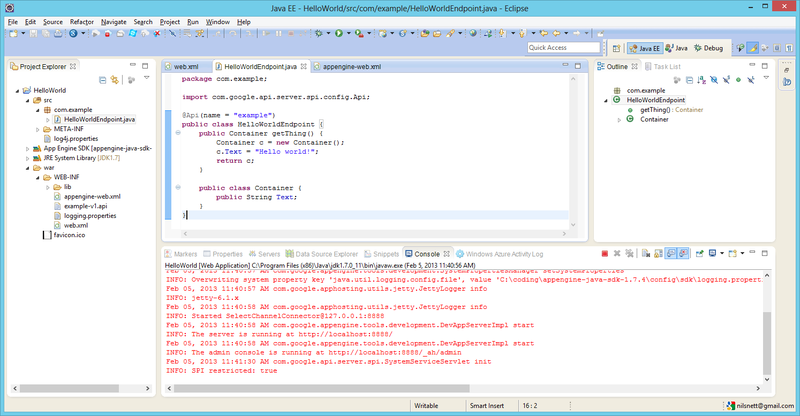 I'm just saying that the framework is indeed embedded in the AppEngine SDK v1.7 which I am using. 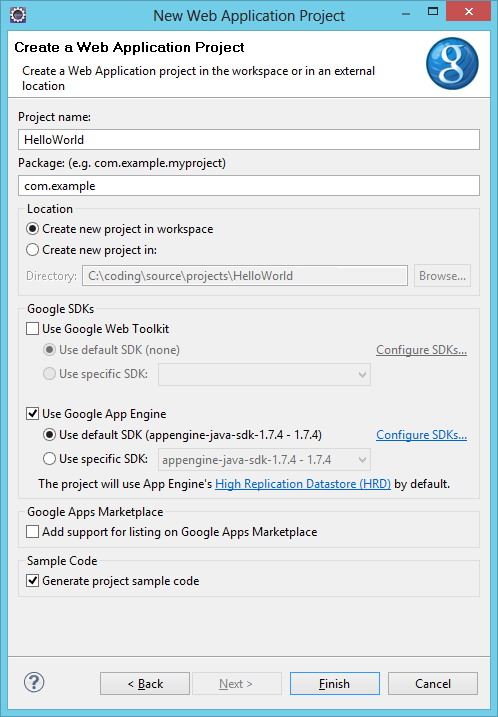 After installing the AppEngine SDK and the plugin for Eclipse you shall have the Google Toolbar available as well. Use this as a verification that you're done with the installation phase. Go to File > New other or hit Ctrl+N in Eclipse. Select Google > Web Application Project. 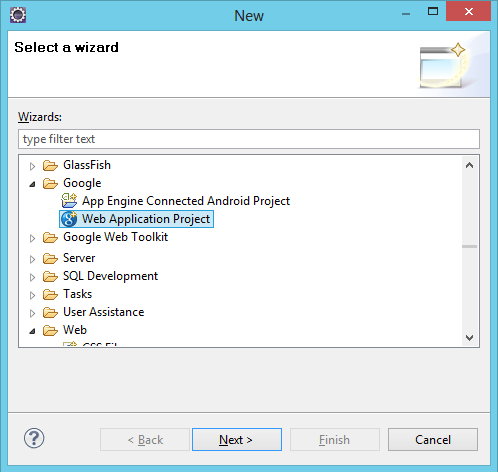 Enter a project name, a package name and uncheck the use of Google Web Toolkit which is a GUI framework we won't be needing for a back-end solution. I will be using "com.example" as package name in this example. Whenever I refer to this package name later, replace with your. Delete /src/com.example/HelloWorldServlet.java and /war/index.html as we will not be using these. UPDATE 11th Feb 2013: The following section was written without knowledge of the path and httpMethod-parameters of the @ApiMethod annotation. See the documentation. While the below is still true, it's far less important to know how URL's are generated because you're not bound to it. Now this is the part that got me. The official Google Cloud Endpoint documentation for Java (as per February 5th 2013) does not specify in detail how the URL's are generated. Instead it encourages you to go ahead and create the client libraries and consume the service that way. While that is the end goal for me as well, I like to know the intermediate steps so that I can debug better and possibly open up for creating clients not supported by the client-code-generating library, like Windows Phone. ApiName The name-parameter of the @Api annotation of the class mapped in services class in web.xml (API-class from now). ***) The framework also generates endpoints accessible through some HTTP RPC URL-convention, which I don't know how works. Feedback on this appreciated. In all of the examples, class T is typically any business entity class. It cannot be System.String. All parameters must be annotaded with @Named. If you break any of these rules the framework will give you a 404 error without any further explanation. 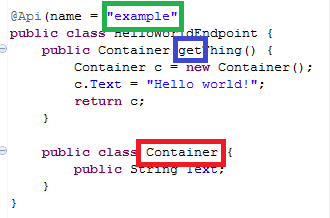 No it's not a mistake that I've now red-boxed the method postfix "Container" in "removeContainer". The remove method does not follow the same code convention as the others. Thank you Google. I sincerely hope this is a bug. Make sure war/WEB-INF/yourapname-v1.api is autogenerated after each compilation. Try removing the @Named-annotation in front of a random input parameter for a method. You will notice that the .api file is not generated. This will result in all of your methods returning 404-errors. really congratulations for your tutorial ! ..Google is often too simple into his documentation and tutorials offered .. if we see that most of GDG, GTUG, Hackathon and other are repetitive with exercises posed by Google, the level of detail of your development is really important.. Thanks so much for this tutorial! It has really helped me a lot and hopefully lot of GAE beginners. I followed all your suggestions but somehow i still get 404 errors. Here is a sample of my code and .api file. Please help me if you can. Its working finally! :) As seen above, i had initialised test obj to null and so there was a NullPointerException which curl did not show but the APIs explorer showed. Really good blog:)I felt this very helpful,,,Even I faced same problem by trying Rest service in GAE but it didnt work ,then I choosed End points as last solution it worked for me Thank you. I searched everywhere for a clean working example and failed to find it till now. Thank you!!! I killed a lot of time on this. It is a first example that actually works! Just one thing. I had 404 thrown always, after a while I realized the problem is that my JDO/JPA version was v2... I changed it to v1 and finally worked. v1 works well enough - I've actually got an app in production using that (www.chineseshowdown.com) . There's a couple of features I miss though, and you'll have a hard time getting support if you ever need it. Milos: Try specifying the endpoint name manually using @ApiMethod over getThing(). Maybe Google have changed the spec since I wrote this blog, I don't know. Other than that I suggest you ask the question at stackoverflow.com as well - might get a lot better answers quicker there!